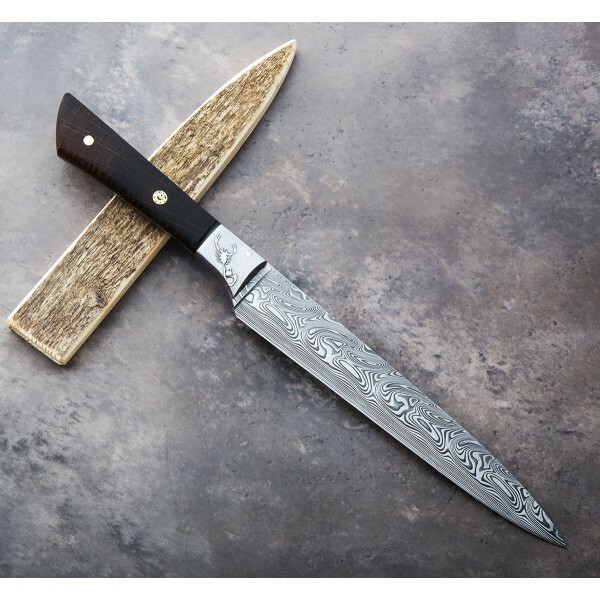 Scorpion mosaic damascus handle bolster's made for Tobbe Lundström by Mattias Styrefors are the namesake of this stunning 175mm / 6.89" Damasteel slicer. With bog oak behind the scorpions, held in place by a single brass pin and unique mosaic pin, this one-of-a-kind culinary tool is beautifully made for daily use, and designed to turn heads while carving and serving in the kitchen or at the dining table. 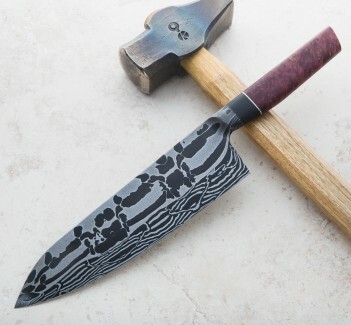 A saya made from reclaimed, weathered barn siding is included. 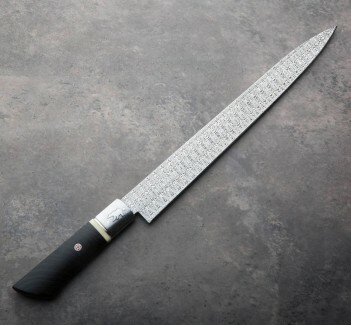 A culinary tool for the chef or host who has it all, a unique, handcrafted chef knife to complete any cutlery collection. 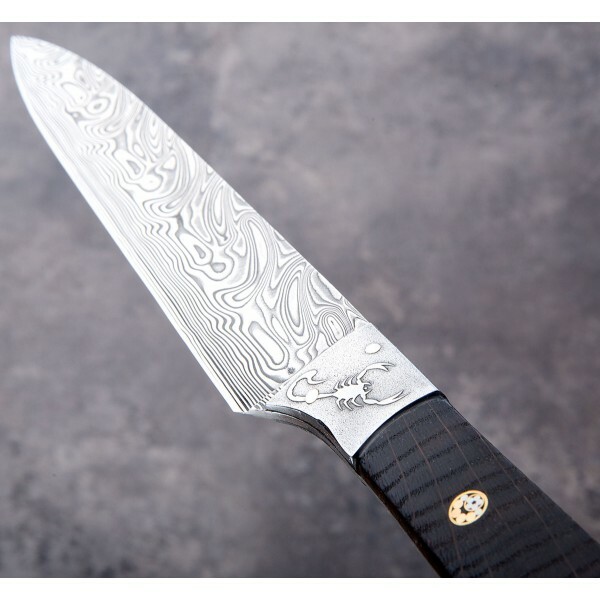 A mid-size slicer at 175mm, this blade is perfect for any kitchen or serving station, handmade using the world's most popular stainless damascus, Damasteel, Torbjörn "Tobbe" Lundström completes the package will locally sourced woods and an aesthetic uniquely his. 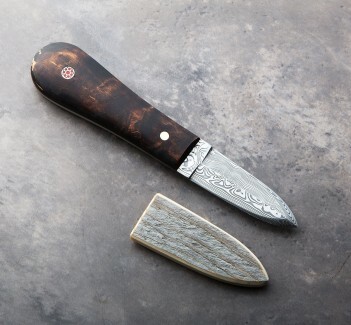 Crafted at his one-man shop in Åre, Sweden, Tobbe has delivered custom chef knives to leading chefs around the world, and his work is not easy to come by.  It's an honor to offer this piece on Eatingtools. Blade length: 175mm (6.89"). Overall length: 305mm / 12". Blade width at heel: 2.3mm. Blade width 1" from the tip: 1.5mm. Blade height at heel: 28mm. 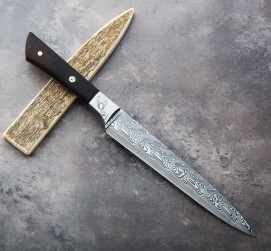 Weight: 4.5 oz / 128 g.
Blade: Stainless damascus Damasteel Thor™ pattern blade. 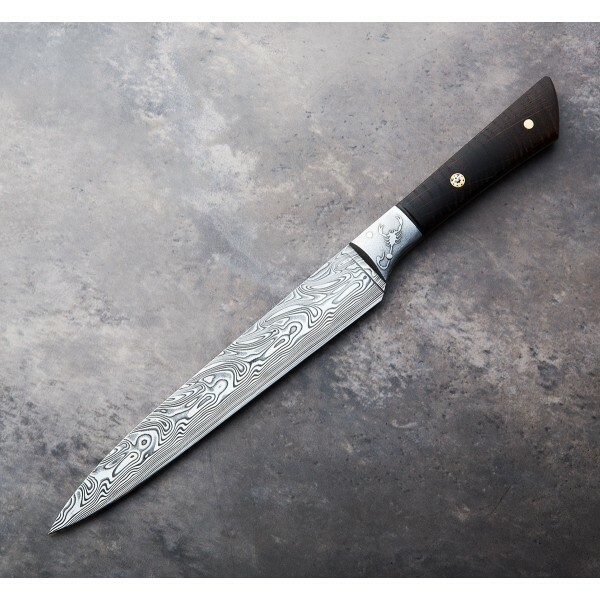 Handle Bolster: handmade mosaic damascus by Mattias Styrefors. Handle: Bog oak with single brass pin and single mosaic pin. Saya: Reclaimed, weathered barn siding.